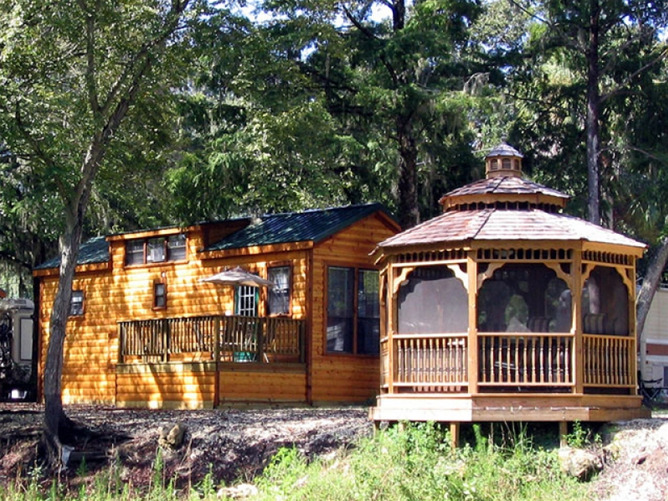 Our Central Florida Cabin and Vacation Rentals are the perfect Weekend Getaway and winter residence, unlike most Campgrounds and RV Resorts we offer Free Canoes and Kayaks with your cabin rental, Luxurious Log Cabins, economical Cottages and select Waterfront RV sites. 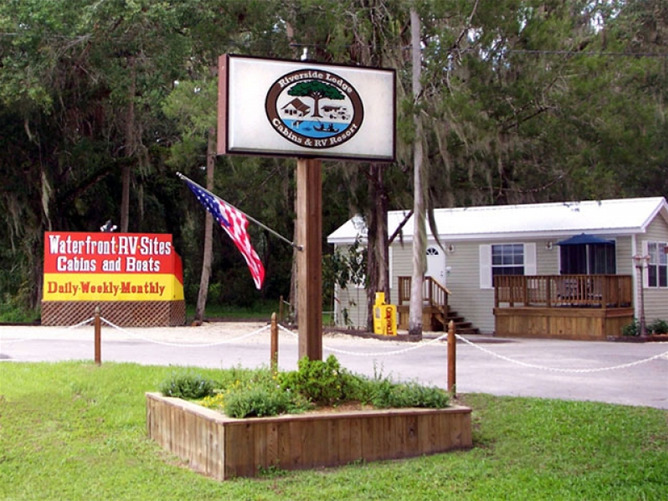 We are pet friendly, airboat enthusiasts, canoe clubs, bicycle, or motorcycle fans are welcome, spend your Florida Vacation in your own RV at our Campground or rent a Cabin at our Resort. 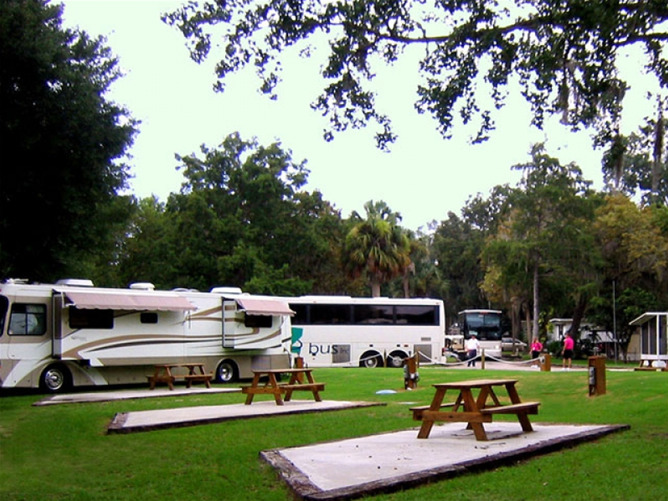 Big Rig friendly resort with extra large sites nestled among majestic palms and ancient live oaks. Nearby activities include biking, kayaking, hiking, hunting, fishing, horseback riding and the Gulf of Mexico. Enjoy the warmth and beautiful nature of Central Florida. Just an hour from the attractions of Orlando and Tampa for easy day trips.
" 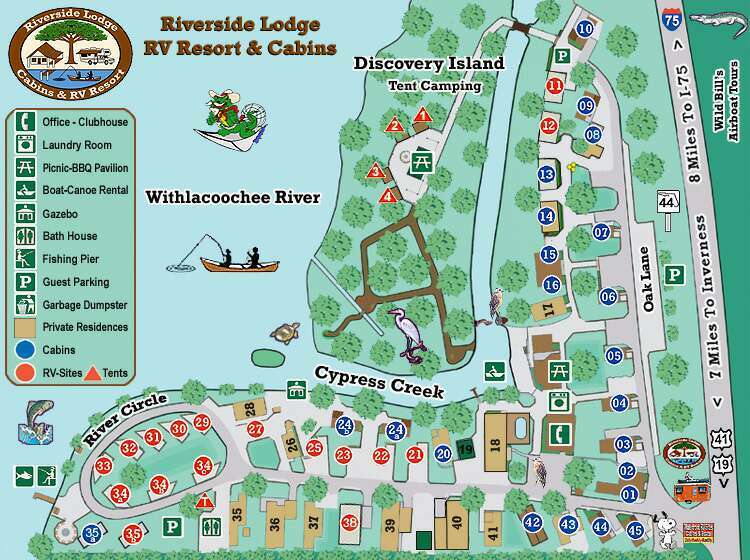 Our Park is unique and offers the best river front setting along the Withlacoochee River! " You’ll appreciate the campground amenities! Quaint clean park on 15-acres in "Florida's Heartland" with Wi-Fi, laundry, shuffleboard and horseshoes. Nearby, enjoy hikes and bike riding on paved back roads. 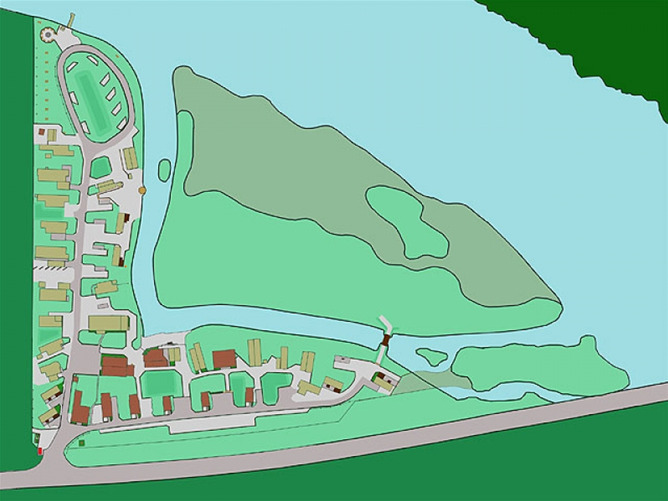 If you're looking for a clean park with long pull-through sites, planned activities, as well as interesting and diverse people from all over the world, then you’ve just found one. Quiet Country setting but only 20 minutes from Brownwood in The Villages. Pool, Fishing, Wi-Fi, Dock. We love snow birds and annuals! 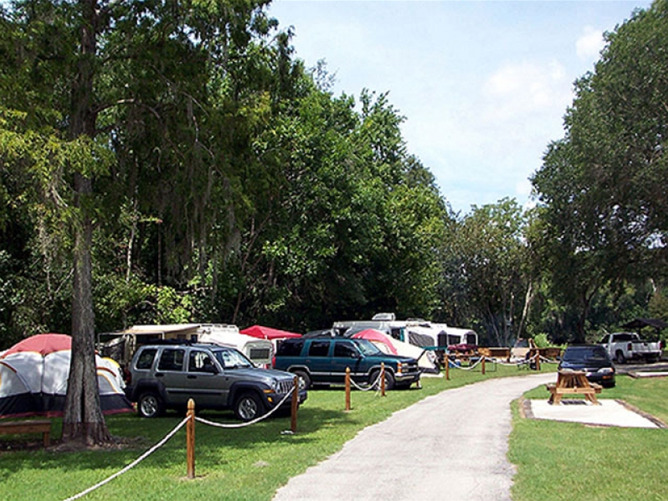 At Paradise Oaks RV Resort, you’ll find yourself warmed by relaxing Florida sunshine and cooled by the evening winds that breeze through the majestic oaks. Located in "Always Sunny" Bushnell, Florida. Enjoy excellent recreational opportunities and the best in quality RV park accommodations. Great central location just 1 hour to Orlando, Daytona and the Gulf beaches. Clean and friendly park with free Wi-Fi, heated pool, spa, laundry, propane, hiking trail, rec hall with satellite big-screen TV, pool table, pet bath and play area, 50/30 amp service, picnic tables, shuffleboard, pull-thrus and full hookups. All major discounts accepted. Big Rig friendly. The only park in Florida for 55 and better singles. Full hookups, mailboxes, laundry, library and activities geared to the singles lifestyle. Shuffleboard, Wi-Fi, horseshoes, screened pavilion and day trips. Clubhouse with A/C and full kitchen. Pets/limitation. Cable fees apply. Max. rig 36'. Happy hour at the fire pit. Good food and happy campers. 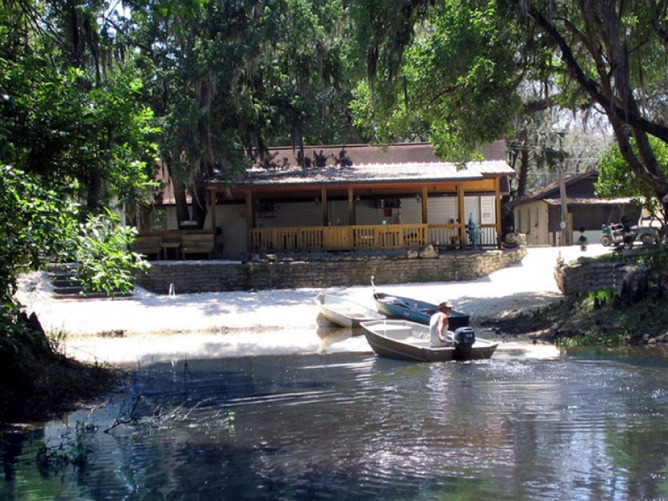 Small town charm in Central Florida at this rally-friendly resort. Located just off I-75 between famous attractions in Tampa and Orlando, Red Oaks’ 130-acre property has over 1,000 full hookup sites and accommodates rigs of any size. Enjoy an array of on-site amenities and planned activities during your stay with features such as 3 heated pools, 4 fishing ponds and a spacious dog park. Cozy Bushnell, Florida has plenty of local attractions and amenities to keep even the most adventurous family busy. When you stay at Blueberry Hill you'll enjoy access to our heated outdoor swimming pool, planned activities, horseshoes, game room, billiards and even a special park for your pets. A roomy, quiet resort sitting on 40-acres. Clubhouse with big screen TV, fireplace and kitchen. Heated pool adjacent to the clubhouse with 5000 sq. ft. of furnished sun deck. Big Rig friendly sites with 30/50 amp service, free Wi-Fi/cable and full hookups.